The Volcker Rule contained in the Dodd-Frank financial reform act bans banks from proprietary trading. In order to implement the Rule, it is necessary to distinguish proprietary trading activities, which are proscribed, from market-making activities and other traditional banking functions, which are allowed. Many traders at banks claim that this distinction is impossible to make in any rational way. Also that it will bury them in a maze of complex and arcane rules and costly compliance systems. We saw two recent commentaries by eminent economists advocating the use of indexed debt instruments. And then I’d say governments need to find ways to spark market innovation in indexing debt instruments. If we had housing loans indexed to, say, regional housing prices, as Bob Shiller has advocated, it would have helped a lot and provided better incentives to borrowers and lenders. If in 200 or 300 years, we’re experiencing fewer and milder financial crises, it will be because we figured out how to put some basic indexation clauses into debt that make it a little less vulnerable to systemic risk. Brokers dealers and investment banks get a substantial amount of their funding from the repo market. In a typical repo, party #1 (the borrower) gets funds from selling securities to party #2 (the lender); when the repo matures the transaction is reversed: party #1 repurchases the securities by paying party #2 the initial funds plus interest (the repo rate). To protect the lender, the funds initially received by the borrower are less than the market value of the securities used as collateral. The difference, reflecting the credit risk of the repo borrower and the volatility in the prices of the securities, is commonly referred to as the haircut. To make matters straight, a repo contains bilateral credit risk for both the lender or the borrower might default. U.S. accounting standards determine that repos be treated as secured financing (FAS 140, §218) in the case of arrangements to repurchase or lend securities typically with as much as 98 per cent collateralization (for entities agreeing to repurchase) or as little as 102 per cent overcollateralization (for securities lenders). In secured financing the loan is reported by the borrower as a liability, while the funds received go to the asset side of the borrower’s balance sheet. More important, in secured loans, the securities remain in the books of the borrower. The idea is that the borrower maintains control of the collateral because it has received sufficient funds to repurchase the securities even if the lender defaults. The problem is that setting an interval [98-102] opens the opportunity for dubious accounting. Suppose that a borrower agreed to a $1M repo with a haircut higher than 2 per cent for liquid fixed income securities, say 4 percent. Then, it would be judged as not having received sufficient funds to repurchase the securities. The repo transaction would then be reported as a sale of securities plus a forward contract to repurchase for $1M securities valued at $1.04M. The sale of securities would be recorded as a credit entry for $1M in cash, but no associated loan. The repo does not increase the liabilities. Furthermore, the cash can be used to pay off additional loans. This is how an increase of $1M in liabilities can show up in the books as a reduction of $1M in liabilities. According to the Valukas report (2010) this is how Lehman systematically deceived the markets. See “Hidden debt: From Enron’s Commodity Prepays to Lehmon’s Repos 105s”, Donald. J. Smith, The Financial Analysts Journal, October 2011. The market is pricing JPMorgan’s outstanding debt with higher spreads, i.e., at a lower value, so JPMorgan books a GAIN equal to the creditors’ market value losses. Commentators on JPMorgan’s announcement are troubled by the paradoxical result that a higher probability of default–or some other cause of higher spreads–produces an earnings gain. Readers can find commentary on this here, here and here, among many other places. If assets and liabilities are going to be accounted for using any version of market value, then there is no way to get around the fact that a drop in the market value of a liability must be a gain to the company. The problem arises not from the market valuation of JPMorgan’s debt, but from a failure to see how this one item fits into the larger picture of the company’s earnings and valuation. If the market’s assessment of the company’s future is driving down the value of the company’s debt, that’s not good news for the company as a whole. If the company’s future is less secure, then the multiple that’s applied to its regular earnings should be much less. Properly assessed, this bad news will always swamp the bump in value from the market valuation of liabilities. In the case of JPMorgan, that means the “value” of its other long-term earnings has declined by a lot more than the $1.9 billion pretax bump from the debt valuation adjustment. It’s that decline that analysts ought to be discussing. SFAS No. 157 requires us to record all liabilities measured at fair value including the effect of our own credit risk. As a result, we will apply a credit spread adjustment in order to reflect our own credit risk in determining fair value for these liabilities which will reduce the recorded amount of these liabilities as of the date of adoption. As a result of this change, we expect to record a pre-tax gain in earnings of a range of approximately $10-$15 million in the first quarter of 2008. But for most non-financials, the scale of the valuation adjustments in liabilities on the books at market value are usually much smaller than they are for financials. 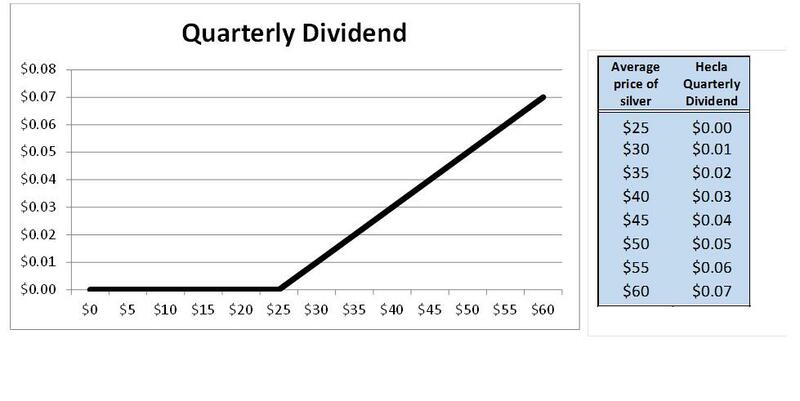 All dividends, including those in the third quarter, would increase or decrease by $0.01 per share for each $5.00 per ounce incremental increase or decrease in the average realized silver price in the preceding quarter. Data from January 1999 to October 2010 show that, with the brief exception of the summer of 2008, silver prices have never been above $25. Prices above $30 are a phenomenon of the last twelve months. Expecting silver prices to go up in the future, Hecla is giving investors extra leverage…if its prediction comes true. It’s not all about end-users. The US Chamber of Commerce is hosting a “fly-in” of corporate representatives tomorrow to lobby Congress and regulators on derivatives reform. They are advocating for a House bill (H.R. 1610) that would block financial regulators policing the risk on bank balance sheets. The Chamber says it wants to allow end-users to buy swaps and other derivatives without posting margin. But that’s not really what’s at issue. The Dodd-Frank Act already includes a specific exemption for end-users who are hedging their business operations. What’s at issue is how much credit risk ends up on the balance sheet of banks. Banks are free to sell end-users non-margined swaps. But each non-margined swap the bank sells adds credit risk to the bank’s balance sheet. That credit risk adds up. A prudently managed bank will have policies, procedures and controls to assess how much total risk it has in its portfolio of non-margined swaps. It will have to put aside capital in proportion to the risk. Not all banks can claim to have an impeccable track record in managing the risks on their derivatives portfolios. As if 2008 wasn’t enough of a lesson, the recent $2.3 billion loss at UBS is another reminder. Apparently at UBS the cause was compliance failure. Systems cost banks money, and the incentives to dedicate resources to maintain controls at times vanish. Remember BP’s Horizon deepwater well? No difference, here. Risk management is also quite challenging when banks and swap dealers offer counterparties tailor-made and complex derivatives contracts – the so called Level-3 assets, which may not trade and are priced based on an in-house model, precisely the swaps that are non-margined. All this calls for banks to put aside more resources to manage risks and more capital. The problem is that both eat into banks’ return on equity. In April, five regulators – the Federal Reserve Board, the Farm Credit Administration, the Federal Deposit Insurance Corporation, the Federal Housing Finance Agency, and the Office of the Comptroller of the Currency – published a proposed rule detailing what would be required of the banks. Under the rule, banks are free to sell an end-user a non-margined swap. But banks must have appropriate policies in place to assess and manage the risk and must put aside capital to cover the risk. H.R. 1610 is a directive to the financial regulators to turn a blind eye to the credit risk from non-margined swaps. From exemption to exemption, from special case to exception, if we follow the Chamber down this path, we will find ourselves in another financial mess. 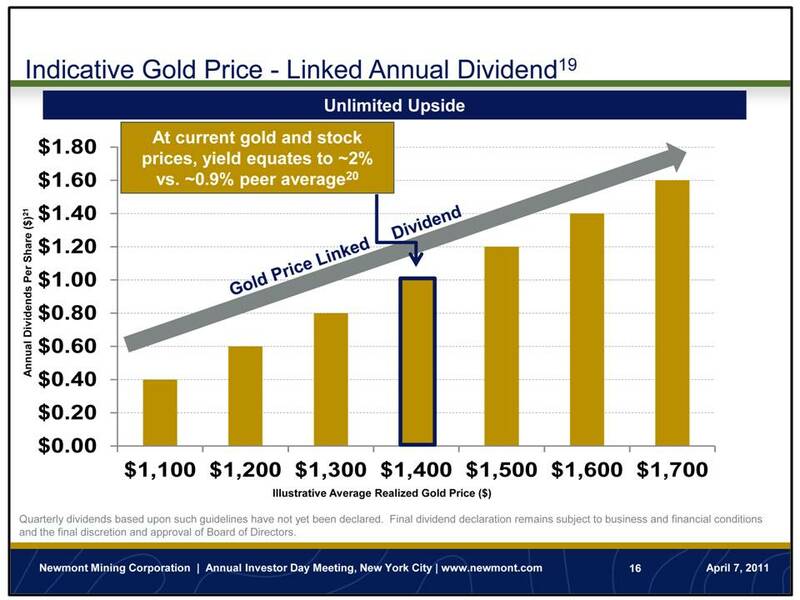 What does the promise of a gold-linked dividend provide above and beyond what investors in Newmont already had? Aswath Damodaran, at NYU, has a nice post on the right and wrong ways to implement valuations in the light of the historically low interest rates on Treasuries and other sovereign debt. The trick is to think through the consequences on all elements of the valuation.